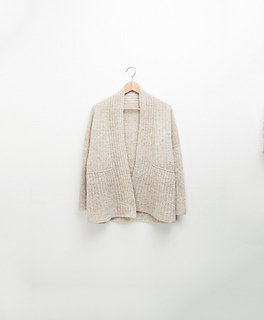 Ward off the morning chill in a drafty old house with an open-front cardigan of feather-light Loft. 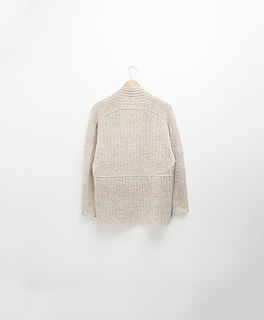 Elizabeth Doherty is known for assembling classic, tailored garments from unexpected shapes; here she has created a modern drop-shoulder cardigan with a relaxed air. Woodfords is a delicious puzzle in seamless construction, sure to appeal to knitters who love inventive shapes and new approaches. Decorative lateral braids highlight directional shifts in the knitting and also add structure to an elastic fabric of broken and seeded rib. Short rows cleverly concealed in the textured fabric produce a comfortable fit at the shoulders and sleeve caps. Woodfords is a garment you can throw on over casual outfits or dress up for work. 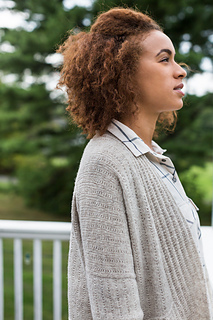 Choose a size close to your actual bust measurement if you prefer a trimmer silhouette, keeping in mind that dimensions are given with the fronts overlapped and the cardigan will be roomier when left to hang open. We’ve styled it with about two inches of ease. 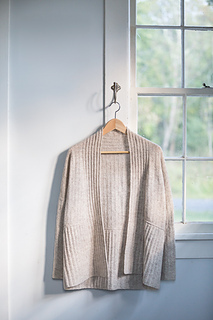 Notes on fitting the cardigan, and adjusting for row gauge differences can be found here. Need help? If you have questions about Woodfords—or just want to share your progress—please visit the Woodfords discussion thread in the Blue Bee Knits group.